I found this one laying on the ground near the giant cedar tree in front of the house. It was probably knocked down during one of the back to back storms in July (since we haven't had any storms--or even any rainfall to speak of--since then). It just took me a while to find it. It's one of the smaller types, less than three inches across and similar to several I already have. But as I mentioned before, each bird nest is a unique work of art. I saw two little puffs of wool lining the inside right away, but a closer inspection revealed several delicate hairs along the inside as well. I pulled one out, and although it resembled human hair, it definitely wasn't mine or Joe's. (I do have one bird nest that has a piece of my long hair woven throughout it--what a magical find that was.) And then I realized it was half white and half dark. Nobody I know has hair like that. Except maybe. . .A quick tummy rub, and the mystery was solved--they were Lucky Buddy Bear belly hairs! There is certainly no shortage of nesting material on this farm. Click here if you'd like to see another recently found nest and read a little bit about my collection. Never leave the chickenz unattended for extdended periods, Susan. Things happen. Your collections (heart rocks, nests, etc.) are so unusual, and so organic. 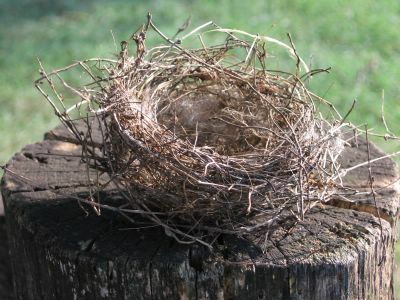 Birds' nests always amaze me in their combination of delicacy and strength. BTW: I, too, love Pinetree Garden Seeds. Saw that in an old post of yours and was happy to see someone else spreading the PGS word. Me thinks that U all (ya'll) are much too creative for this late at night.... R There just a clutch of creative riters out there or what??? Skye Bird-dee thinks that bird nests are cool! If they are not where they are supposed to be, does that mean that some strong winds came along and dumped rain on your plot of heaven on earth??? I like the second nest better than the fuzzy one. I have 5-6 like that now. I just stumbled upon your site yesteday. It's lovely and spurred some great internal dialogue. I can't wait to try to the tomato pesto pie. hi, just found your blog..and my..this is one swell blog..i tell you susan!all things are here from recipe to gerdening to photography to body lotion and sunscreen!wheeww!..this is superb..by the looks of it,you are one intelligent and beautiful person..i like your blog ,there is so much to learn here.thanks for sharing..o browsed around your kitchen garden and loved it!